How do I design and code tags? I'm designing a newsletter template with tags, and the tags are really given me hard times. No limit of amount for the tags. No charaters limit to each tag. 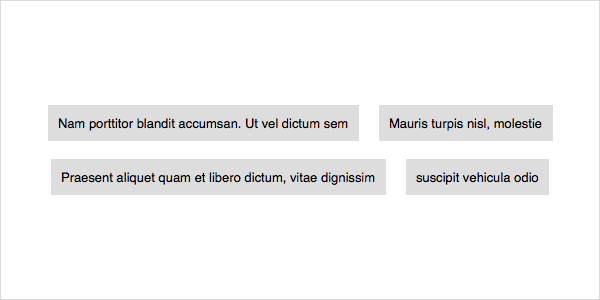 These tags are within a rectangle which is max width 600px. I've try to use <table>, but <table> will break when viewing mobiles. These<table> will broken when viewing mobiles, it can't be responsive. In fact, I don't know why. When I remove the <table> of tags, the mobiles will be normal. Once I put them back, the responsive broken. Since I can't limit the characters in tag, there is pain in the rows, like how many tags will be in one row? But under the situation of tags, I still want to looking for is any other method out there. And last, attached the mockup, this is the look I want to achieve. Thank you Brett, It works in many clients. But I have to change to <span>, because of Outlook 2013.